How was your special field research day? The shiny rate seemed to be around 10%, much better than Feebas day. It’s overall a pretty good event despite the fact that there were some network errors that I had to restart the game several times during event time. 5 shiny out of 33 caught, might have 1 or 2 stacked in the research queue. 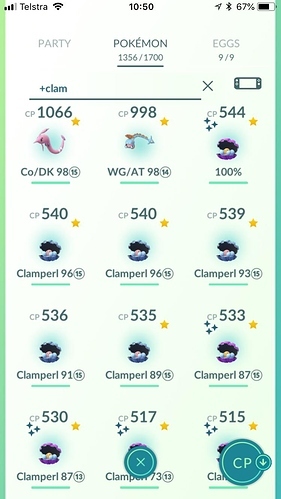 I caught 27 Clamperl, but only 1 shiny. That shiny became a Gorebyss. I was also able to land a regular Gorbyss as well as a Huntail. Also: Caught a Latias and a shiny Luvdisc. Yeah, today was fun. This is how events like these should be. Fantastic at first…then came evolving nothing but Huntail. That really burned. I evolved SIX in a row and not one Gorebyss? That’s a 1.6% chance, and not even RNG can paint that to be not BS. Got 42 Quests done banking all the Clampearl for catchining after the event with Pinaps. Got my first Shundo Plus 4 other Shiny. Have a couple of 98% and 96% in the collection too. Haven’t evolved any yet until final IV checking has been completed. What’s left after clean up. Have you obtained an off-event shiny? What evolutions of Clamperl have you obtained?